What is Nuestros Pequeños Hermanos? Nuestros Pequeños Hermanos is a charitable organization serving orphaned and abandoned children in Latin America and the Caribbean. Its mission is to provide shelter, food, clothing, healthcare and education in a Christian family environment based on unconditional acceptance and love, sharing, working and responsibility. A worldwide community of donors, staff and volunteers enables NPH to help the children become caring and productive citizens in their countries. 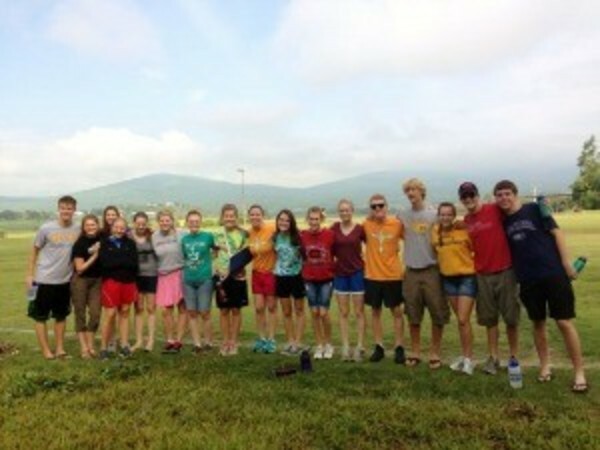 Each year, Holy Name of Jesus high school teens participate in a mission trip to one of the designated areas. This August teens and adults from HNOJ travel to the Casa Santa Ana, in the Dominican Republic, a home in the Nuestros Pequeños Hermanos system of orphanages. ﻿While at the house, we put on a VBS experience for 6-8 year-olds during the day and spend our afternoons and evenings giving attention to children who desperately need it. Each night we take some time to reflect on our day's activities and how we experienced God in the most vulnerable and marginalized. There are a limited number of spots on the trip. The dates of the trip are Sunday, July 29 – Aug. 5. Holiday Gas Station BBQ & Car Wash: TBD, 11 a.m. -1 p.m. Your business logo can be printed on the back of the trip shirt for a contribution. Download the form. Your business can sponsor the Walking Taco Sales. Download the form. Special Collection A special collection for the NPH orphanage will be offered July 22-23. Child sponsorships and donations are always welcome. To learn more about NPH, you can contact HNOJ parishioners Karen Richelsen at 612-730-7669 or karen.richelsen1@gmail.com or visit the NPH website.